A decade or two ago eating out meant a little fried rice accompanied by some very generic entrees at a neighbourhood Chinese restaurant. We neither had the option nor the adventurous palette to try out new cuisines from far away lands. But now a decade later, you name it and Dhaka's got it. Be it the succulence of sushi, the tenderness of tenderloin or the scrumptiousness of scampi, we've pretty much got it all. And amongst these various cuisines, one was quick to gain vast popularity: Italian. 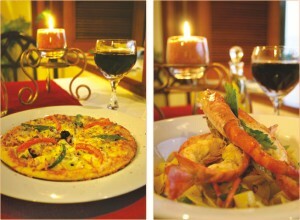 With its creamy pastas and cheesy pizzas, Italian cuisine simply shot up to stardom. Yet even with the growing demands it is hard to find an eatery that served authentic Italian cuisine. And that is partly because people look in the wrong place. One Italian eatery that has been around since 1996 is Ciao, hotel Pan Pacific Sonargaon's in- house answer to authentic Italian food. And authentic it truly is- from the major details such as food down to the minor details such as interiors and music. Everything about this restaurant screams of Italy. Ciao has been serving authentic Italian for over a decade now. And with growing demands for this cuisine, it too has broadened its horizons to bring some Italian treats that aren't available anywhere else in town. Italian cuisine is very much about courses and Ciao sees to it that customers have some very unique dishes to choose from in each course. For starters Ciao offers raw beef Carpaccio- a concoction of marinated paper-thin slices of beef, chilled and served with cheese and ground pepper. It is an item that no other restaurant in town offers. But for those who aren't bold enough for this delicacy, Calamari (squid) Rings or Bruschetta, a type of bread are perfect starters. Their pastas are just as diverse. For vegetarians, the Spinach Cannelloni is a perfect choice while meat lovers can go for Lasagna made with authentic, imported tenderloin meat. But if you're a seafood lover like me, Grilled Prawn Fettucini is the pasta to try. Resting over a bowl of flavourful pasta, the prawn is grilled to perfection and creates the perfect balance with the flavours in the pasta. Pizza is where foodies have a chance to play. While Ciao highlights Margherita, a pizza topped with tomato and mozzarella cheese, they have a selection of over a dozen toppings that you can add on according to your palate. Some of the more exotic toppings include squid, bell peppers and smoked chicken. For the main course, the Pesto flavoured Bhetki fish is a must have. Nestled in a slightly tangy concoction of tomatoes, eggplant and a world of other ingredients, the muted taste of the fish when infused with the ingredients it's nestled in makes the perfect balance. Other main courses to watch out for are the Pan Fried Salmon and the St Martin’s Lobster, brought in straight from St Martin’s. To finish off the meal, the Hot Apple and Sultana (raisin) Pie or the B&W Double Chocolate Mousse is perfect. But if you're in the mood for something closer to home but with a twist, Ciao's take on paatishapta or Custard Filled Pancake as they like to call it is simply sinful. Resting on a bed of caramelised bananas and filled with a banana essence cream, this dessert is truly a mouth-watering experience. With a chef trained internationally, top-of-the-line, often imported, ingredients and an ambience that reflects the cuisine, Ciao is Dhaka's answer to authentic Italian cuisine. So the next time you're in the mood for mangia, swing by Ciao. You won't be disappointed. Lakme has taken the initiative to promote the emerging talents in the fashion and beauty industry. With the launch of its new line of summer cosmetics, Freespirit, the brand arranged "Lakme NextGen Designer Search 2007" with a motto to discover new talents in the fashion designing industry of Bangladesh. Students of three of Bangladesh's fashion schools- Shanto Mariam University, INIFD and FID took part in this competition with their creative designs. Naushadul Karim Chowdhury, Brands & Development Director of Unilever Bangladesh Limited inaugurated the event with a briefing session held at Spectra Convention Centre on May 5, 2007. Among others, sculptor Ferdousi Priyobhashini, fashion designer Shahruk Shahid and fashion photographer David Barikder were present as the honourable jury panel. Teachers and faculty members of the three institutes were also present on the occasion. After having the detailed briefing, the participants prepared themselves for the competition. The participants worked on their interpretation of the concept "Freespirit" given by Lakme and submitted their portfolio accordingly to the judges. With the clock ticking by contestants rushed to get their work together from making sketches according to the concept, creating a colour story, matching fabrics, cutting, sewing, etc. All of them were required to do a round of research on the concept to gather their creative ideas and references. By May 26, 2007 they finished all their preparations and even did a dress rehearsal on the runway. The preliminary round of the Lakme NextGen Designer Search 2007 took place at Sports Zone on May 27, 2007. As the contestants were invited on stage, they introduced themselves and gave a short description of their collection to the judges. The show then began with models wearing both day and nightwear designs. At the end of the show the judges deliberated and then announced the names of the ten NextGen designers going to the final round of the competition. Of the ten finalists selected, Ashequa Hossain, Regina Dhamani, Fahmida Afrin Tultul, Mahmudur Rahman Shojib, Kamrul Islam Riffat and Farah Diba Ismail are in various semesters at Shanto Mariam University. The three finalists from INIFD are Shaziya Sultana Sheela, Shahmina Akhtar Dina and Forhad Selim. FID scored one contestant, Mirza Shafaruh Shumi. But this is not the end. These 10 NextGen designers will compete for the best 3 positions in the final round of the competition. And the 3 left standing will be the named the NextGen Designers by Lakme in a Gala Show. So if you're interested to see what our fashion industry has to belt, keep your eyes open and watch Bangla Vision, the official media partner, on June 15, 2007 at 9:00 pm to know more.